It's 3:00am and you've just wandered back to your hotel room after a night of drunken revelry at pure platinum. It's a struggle to just keep your eyelids open; you're so tired you don't even bother to brush your teeth. In the back of your mind you remember that there's a game tomorrow morning and you're supposed to be shooting it. Hummmm, better set the alarm. You reach over to the clock radio on the nightstand and ponder for a few minutes, then slide a switch and push a couple of buttons. "My alarm didn't go off' or "I didn't get my wake up call" are not considered acceptable excuses to your assignment editor or the DOP, or the publisher. Grundig Porsche design, AM, FM stereo, International shortwave radio alarm. What you need is a Travel clock radio. One that you carry with you on the road for use at budget priced (read cheAP) lodgings that have no such amenities or at "W" properties that have combo clock radio / CD player / cassette players that require a degree in electrical engineering to operate. $149.95, Grundig Porsche design, AM, FM stereo, International shortwave. 5.5 in wide, 3.5 in high, 1.25 in deep. Nice yuppie leather case and a sleek F.A. Porsche design. Sound quality is really good. Auto channel scanning is a little iffy with moderate to weak stations. Setting the alarm time can be a little tricky. $99.95, Grundig eTraveller VII, AM, FM stereo, International shortwave. 2.5 in wide, 4.5 in high, .875 deep. Thin and light profile, kinda like an oversized Star trek communicator except that it opens sideways. 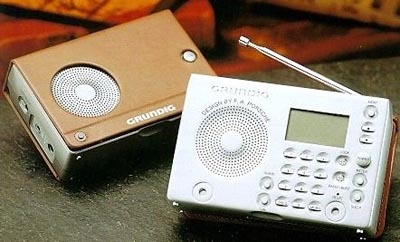 Grundig Traveller II, AM, FM stereo, International shortwave radio alarm. Killer-stomper dual conversion super heterodyne circuitry locks in the weakest signals. The all-band continuous short-wave coverage makes it easy to listen to radio free Osama land. Sound is a bit on the tinny side and the interface takes a little getting used to. 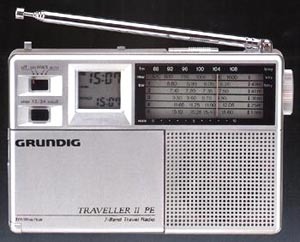 $49.95, Grundig Traveller II PE, AM, FM, International shortwave. 5.5. in wide, 3.5 in high, 1.25 in deep. Old school analog knob tuning makes getting weak stations a hit or miss affair, especially with the shortwave frequencies. Sound quality is ok though. Excellent user interface, just flip down the front cover and rotary dial lets you chose from 24 different time zones. Once you set the home time, turning the dial lets you jump from time zone to time zone without having to reset your clock. Plus it has dual display showing your home time and your current time zone. Another killer feature is the "HWS" humane wake system. When the alarm goes off, it starts off softly and builds in volume over a minute, either music or tone. No more getting jolted out of bed.